Many quilters use a “design wall” to lay out their patterns. This allows a person to better see what the overall effect will be, as looking at something layed out on the floor can be tricky and distort the perspective. Clicking that image will take you to this girl’s post about her quilting studio. Holy smokes! It’s huge and covet-worthy. It makes me dream of expanding our second floor over the garage for this express purpose! In between the two extremes, some folks tack some batting to the wall, then cover it with flannel for a nice surface. 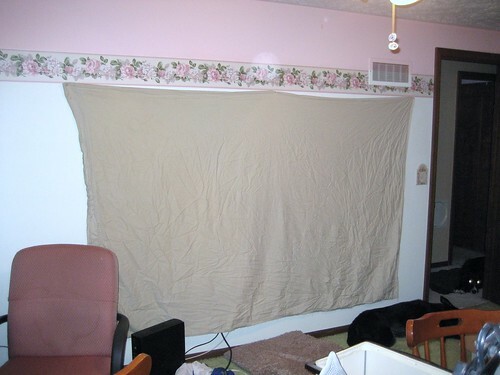 I have a great wall for this purpose, and I’ll probably start out with the draped sheet approach until I can grab a big bag of cheap poly batting. With dogs and cats and people running around, laying out on the floor is just too dicey a prospect to keep up at this juncture. Tonight, in amidst the pre-washing and fabric-fondling and the oogling and the planning, I hung up a sheet to see if that approach will work for me. I also realized I’m going to need a lot more pins.